Proprietary Name: Nifedipine What is the Proprietary Name? Non-Proprietary Name: Nifedipine What is the Non-Proprietary Name? Nifedipine with NDC 50742-261 is a a human prescription drug product labeled by Ingenus Pharmaceuticals, Llc. The generic name of Nifedipine is nifedipine. The product's dosage form is tablet, extended release and is administered via oral form. FDA Application Number: ANDA210614 What is the FDA Application Number? Nifedipine is a drug belonging to a class of pharmacological agents known as the calcium channel blockers. 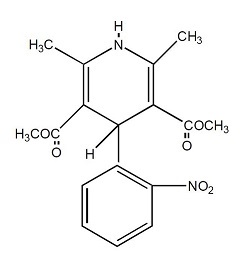 Nifedipine is 3,5-pyridinedicarboxylic acid, 1,4-dihydro-2,6-dimethyl-4- (2-nitrophenyl)-, dimethyl ester, C17H18N2O6, and has the structural formula:Nifedipine is a yellow crystalline substance, practically insoluble in water but soluble in ethanol. It has a molecular weight of 346.3. Nifedipine extended-release tablets are formulated as a once-a-day controlled-release tablet for oral administration designed to deliver 30, 60, or 90 mg of nifedipine.Inert ingredients in the nifedipine extended-release tablet formulation are lactose monohydrate, microcrystalline cellulose, hypromellose, hydroxyethyl cellulose, ethylcellulose, sodium lauryl sulfate, magnesium stearate, methacrylic acid and methyl methacrylate copolymer, polyethylene glycol, talc, polyvinyl alcohol, titanium dioxide(30mg and 60mg), iron oxide yellow, iron oxide red, lecithin (soya) (30 mg and 90 mg), iron oxide black (30 mg and 90 mg). Nifedipine extended-release tablet is designed for once-a-day oral administration. The extended-release tablet uses two release-rate controlling mechanisms: a primary polymer matrix core composed of drug with excipients and a secondary enteric coating surrounding the core. Upon swallowing, water is taken up through the enteric coating membrane into the primary core matrix, and the enteric coating membrane will dissolve at rising gastrointestinal pH value, which in turn slowly releases the drug from the formulation.FDA approved dissolution test specifications differ from USP. Nifedipine is a calcium ion influx inhibitor (slow-channel blocker or calcium ion antagonist) and inhibits the transmembrane influx of calcium ions into cardiac muscle and smooth muscle. The contractile processes of cardiac muscle and vascular smooth muscle are dependent upon the movement of extracellular calcium ions into these cells through specific ion channels. Nifedipine selectively inhibits calcium ion influx across the cell membrane of cardiac muscle and vascular smooth muscle without altering serum calcium concentrations. The precise mechanisms by which inhibition of calcium influx relieves angina has not been fully determined, but includes at least the following two mechanisms:1) Relaxation and Prevention of Coronary Artery SpasmNifedipine dilates the main coronary arteries and coronary arterioles, both in normal and ischemic regions, and is a potent inhibitor of coronary artery spasm, whether spontaneous or ergonovine-induced. This property increases myocardial oxygen delivery in patients with coronary artery spasm, and is responsible for the effectiveness of nifedipine in vasospastic (Prinzmetal's or variant) angina. Whether this effect plays any role in classical angina is not clear, but studies of exercise tolerance have not shown an increase in the maximum exercise rate-pressure product, a widely accepted measure of oxygen utilization. This suggests that, in general, relief of spasm or dilation of coronary arteries is not an important factor in classical angina.2) Reduction of Oxygen UtilizationNifedipine regularly reduces arterial pressure at rest and at a given level of exercise by dilating peripheral arterioles and reducing the total peripheral vascular resistance (afterload) against which the heart works. This unloading of the heart reduces myocardial energy consumption and oxygen requirements, and probably accounts for the effectiveness of nifedipine in chronic stable angina. The mechanism by which nifedipine reduces arterial blood pressure involves peripheral arterial vasodilatation and the resulting reduction in peripheral vascular resistance. The increased peripheral vascular resistance that is an underlying cause of hypertension results from an increase in active tension in the vascular smooth muscle. Studies have demonstrated that the increase in active tension reflects an increase in cytosolic free calcium.Nifedipine is a peripheral arterial vasodilator which acts directly on vascular smooth muscle. The binding of nifedipine to voltage-dependent and possibly receptor-operated channels in vascular smooth muscle results in an inhibition of calcium influx through these channels. Stores of intracellular calcium in vascular smooth muscle are limited and thus dependent upon the influx of extracellular calcium for contraction to occur. The reduction in calcium influx by nifedipine causes arterial vasodilation and decreased peripheral vascular resistance which results in reduced arterial blood pressure. Nifedipine is completely absorbed after oral administration. Plasma drug concentrations rise at a gradual, controlled rate after a nifedipine extended-release tablets dose and reach a plateau at approximately six hours after the first dose. For subsequent doses, relatively constant plasma concentrations at this plateau are maintained with minimal fluctuations over the 24-hour dosing interval. About a four-fold higher fluctuation index (ratio of peak to trough plasma concentration) was observed with the conventional immediate-release nifedipine capsule at t.i.d. dosing than with once daily nifedipine extended-release tablets. At steady-state, the bioavailability of the nifedipine extended-release tablets is 86% relative to nifedipine capsules. Administration of the nifedipine extended-release tablets in the presence of food slightly alters the early rate of drug absorption, but does not influence the extent of drug bioavailability. Markedly reduced gastrointestinal retention time over prolonged periods (i.e., short bowel syndrome), however, may influence the pharmacokinetic profile of the drug which could potentially result in lower plasma concentrations. Pharmacokinetics of nifedipine extended-release tablets are linear over the dose range of 30 to 180 mg in that plasma drug concentrations are proportional to dose administered. There was no evidence of dose dumping either in the presence or absence of food for over 150 subjects in pharmacokinetic studies.Nifedipine is extensively metabolized to highly water-soluble, inactive metabolites, accounting for 60 to 80% of the dose excreted in the urine. The elimination half-life of nifedipine is approximately two hours. Only traces (less than 0.1% of the dose) of unchanged form can be detected in the urine. The remainder is excreted in the feces in metabolized form, most likely as a result of biliary excretion. Thus, the pharmacokinetics of nifedipine are not significantly influenced by the degree of renal impairment. Patients in hemodialysis or chronic ambulatory peritoneal dialysis have not reported significantly altered pharmacokinetics of nifedipine. Since hepatic biotransformation is the predominant route for the disposition of nifedipine, the pharmacokinetics may be altered in patients with chronic liver disease. Patients with hepatic impairment (liver cirrhosis) have a longer disposition half-life and higher bioavailability of nifedipine than healthy volunteers. The degree of serum protein binding of nifedipine is high (92–98%). Protein binding may be greatly reduced in patients with renal or hepatic impairment.Following intravenous administration, clearance of nifedipine was decreased by 33% in elderly healthy subjects relative to young healthy subjects. Like other slow-channel blockers, nifedipine exerts a negative inotropic effect on isolated myocardial tissue. This is rarely, if ever, seen in intact animals or man, probably because of reflex responses to its vasodilating effects. In man, nifedipine decreases peripheral vascular resistance which leads to a fall in systolic and diastolic pressures, usually minimal in normotensive volunteers (less than 5–10 mm Hg systolic), but sometimes larger. With nifedipine extended-release tablets, these decreases in blood pressure are not accompanied by any significant change in heart rate. Hemodynamic studies in patients with normal ventricular function have generally found a small increase in cardiac index without major effects on ejection fraction, left ventricular end diastolic pressure (LVEDP), or volume (LVEDV). In patients with impaired ventricular function, most acute studies have shown some increase in ejection fraction and reduction in left ventricular filling pressure. Although, like other members of its class, nifedipine causes a slight depression of sinoatrial node function and atrioventricular conduction in isolated myocardial preparations, such effects have not been seen in studies in intact animals or in man. In formal electrophysiologic studies, predominantly in patients with normal conduction systems, nifedipine has had no tendency to prolong atrioventricular conduction or sinus node recovery time, or to slow sinus rate. Nifedipine extended-release tablets are indicated for the management of vasospastic angina confirmed by any of the following criteria: 1) classical pattern of angina at rest accompanied by ST segment elevation, 2) angina or coronary artery spasm provoked by ergonovine, or 3) angiographically demonstrated coronary artery spasm. In those patients who have had angiography, the presence of significant fixed obstructive disease is not incompatible with the diagnosis of vasospastic angina, provided that the above criteria are satisfied. Nifedipine extended-release tablets may also be used where the clinical presentation suggests a possible vasospastic component, but where vasospasm has not been confirmed, e.g., where pain has a variable threshold on exertion, or in unstable angina where electrocardiographic findings are compatible with intermittent vasospasm, or when angina is refractory to nitrates and/or adequate doses of beta blockers. Nifedipine extended-release tablets are indicated for the management of chronic stable angina (effort-associated angina) without evidence of vasospasm in patients who remain symptomatic despite adequate doses of beta blockers and/or organic nitrates or who cannot tolerate those agents.In chronic stable angina (effort-associated angina), nifedipine has been effective in controlled trials of up to eight weeks duration in reducing angina frequency and increasing exercise tolerance, but confirmation of sustained effectiveness and evaluation of long-term safety in these patients is incomplete.Controlled studies in small numbers of patients suggest concomitant use of nifedipine and beta-blocking agents may be beneficial in patients with chronic stable angina, but available information is not sufficient to predict with confidence the effects of concurrent treatment, especially in patients with compromised left ventricular function or cardiac conduction abnormalities. When introducing such concomitant therapy, care must be taken to monitor blood pressure closely, since severe hypotension can occur from the combined effects of the drugs (see WARNINGS). Nifedipine extended-release tablets are indicated for the treatment of hypertension, to lower blood pressure. Lowering blood pressure reduces the risk of fatal and nonfatal cardiovascular events, primarily strokes and myocardial infarctions. These benefits have been seen in controlled trials of antihypertensive drugs from a wide variety of pharmacologic classes including nifedipine extended-release tablets.Control of high blood pressure should be part of comprehensive cardiovascular risk management, including, as appropriate, lipid control, diabetes management, antithrombotic therapy, smoking cessation, exercise, and limited sodium intake. Many patients will require more than one drug to achieve blood pressure goals. For specific advice on goals and management, see published guidelines, such as those of the National High Blood Pressure Education Program's Joint National Committee on Prevention, Detection, Evaluation, and Treatment of High Blood Pressure (JNC).Numerous antihypertensive drugs, from a variety of pharmacologic classes and with different mechanisms of action, have been shown in randomized controlled trials to reduce cardiovascular morbidity and mortality, and it can be concluded that it is blood pressure reduction, and not some other pharmacologic property of the drugs, that is largely responsible for those benefits. The largest and most consistent cardiovascular outcome benefit has been a reduction in the risk of stroke, but reductions in myocardial infarction and cardiovascular mortality also have been seen regularly.Elevated systolic or diastolic pressure causes increased cardiovascular risk, and the absolute risk increase per mmHg is greater at higher blood pressures, so that even modest reductions of severe hypertension can provide substantial benefit. Relative risk reduction from blood pressure reduction is similar across populations with varying absolute risk, so the absolute benefit is greater in patients who are at higher risk independent of their hypertension (for example, patients with diabetes or hyperlipidemia), and such patients would be expected to benefit from more aggressive treatment to a lower blood pressure goal.Some antihypertensive drugs have smaller blood pressure effects (as monotherapy) in black patients, and many antihypertensive drugs have additional approved indications and effects (e.g., on angina, heart failure, or diabetic kidney disease). These considerations may guide selection of therapy.Nifedipine extended-release tablets may be used alone or in combination with other antihypertensive agents. Rarely, patients, particularly those who have severe obstructive coronary artery disease, have developed well documented increased frequency, duration and/or severity of angina or acute myocardial infarction on starting nifedipine or at the time of dosage increase. The mechanism of this effect is not established. It is important to taper beta blockers if possible, rather than stopping them abruptly before beginning nifedipine. Patients recently withdrawn from beta blockers may develop a withdrawal syndrome with increased angina, probably related to increased sensitivity to catecholamines.Initiation of nifedipine treatment will not prevent this occurrence and on occasion has been reported to increase it. Rarely, patients, usually receiving a beta blocker, have developed heart failure after beginning nifedipine. Patients with tight aortic stenosis may be at greater risk for such an event, as the unloading effect of nifedipine would be expected to be of less benefit, owing to the fixed impedance to flow across the aortic valve in these patients. There have been rare reports of obstructive symptoms in patients with known strictures in association with the ingestion of nifedipine extended-release tablets. Bezoars can occur in very rare cases and may require surgical intervention.Cases of serious gastrointestinal obstruction have been identified in patients with no known gastrointestinal disease, including the need for hospitalization and surgical intervention.Risk factors for a gastrointestinal obstruction identified from post-marketing reports of nifedipine extended-release tablets (GITS tablet formulation) include alteration in gastrointestinal anatomy (e.g., severe gastrointestinal narrowing, colon cancer, small bowel obstruction, bowel resection, gastric bypass, vertical banded gastroplasty, colostomy, diverticulitis, diverticulosis, and inflammatory bowel disease), hypomotility disorders (e.g., constipation, gastroesophageal reflux disease, ileus, obesity, hypothyroidism, and diabetes) and concomitant medications (e.g., H2-histamine blockers, opiates, nonsteroidal anti-inflammatory drugs, laxatives, anticholinergic agents, levothyroxine, and neuromuscular blocking agents). Cases of tablet adherence to the gastrointestinal wall with ulceration have been reported, some requiring hospitalization and intervention. Hypotension: Because nifedipine decreases peripheral vascular resistance, careful monitoring of blood pressure during the initial administration and titration of nifedipine is suggested. Close observation is especially recommended for patients already taking medications that are known to lower blood pressure (see WARNINGS).Peripheral Edema: Mild to moderate peripheral edema occurs in a dose dependent manner with an incidence ranging from approximately 10% to about 30% at the highest dose studied (180 mg). It is a localized phenomenon thought to be associated with vasodilation of dependent arterioles and small blood vessels and not due to left ventricular dysfunction or generalized fluid retention. With patients whose angina or hypertension is complicated by congestive heart failure, care should be taken to differentiate this peripheral edema from the effects of increasing left ventricular dysfunction. Nifedipine extended-release tablets should be swallowed whole. Do not chew, divide or crush tablets. Do not be concerned if you occasionally notice in your stool something that looks like a tablet. In nifedipine extended-release tablets, the medication is contained within a nonabsorbable shell that has been specially designed to slowly release the drug for your body to absorb. When this process is completed, the empty tablet is eliminated from your body. Rare, usually transient, but occasionally significant elevations of enzymes such as alkaline phosphatase, CPK, LDH, SGOT and SGPT have been noted. The relationship to nifedipine therapy is uncertain in most cases, but probable in some. These laboratory abnormalities have rarely been associated with clinical symptoms; however, cholestasis with or without jaundice has been reported. A small (5.4%) increase in mean alkaline phosphatase was noted in patients treated with nifedipine extended-release tablets. This was an isolated finding not associated with clinical symptoms and it rarely resulted in values which fell outside the normal range. Rare instances of allergic hepatitis have been reported. In controlled studies, nifedipine extended-release tablets did not adversely affect serum uric acid, glucose, or cholesterol. Serum potassium was unchanged in patients receiving nifedipine extended-release tablets in the absence of concomitant diuretic therapy, and slightly decreased in patients receiving concomitant diuretics.Nifedipine, like other calcium channel blockers, decreases platelet aggregation in vitro. Limited clinical studies have demonstrated a moderate but statistically significant decrease in platelet aggregation and an increase in bleeding time in some nifedipine patients. This is thought to be a function of inhibition of calcium transport across the platelet membrane. No clinical significance for these findings has been demonstrated.Positive direct Coombs test with/without hemolytic anemia has been reported, but a causal relationship between nifedipine administration and positivity of this laboratory test, including hemolysis, could not be determined.Although nifedipine has been used safely in patients with renal dysfunction and has been reported to exert a beneficial effect, in certain cases, rare, reversible elevations in BUN and serum creatinine have been reported in patients with preexisting chronic renal insufficiency. The relationship to nifedipine therapy is uncertain in most cases but probable in some. Beta-adrenergic blocking agents: (see INDICATIONS AND USAGE and WARNINGS.) Experience in over 1400 patients with nifedipine capsules in a noncomparative clinical trial has shown that concomitant administration of nifedipine and beta-blocking agents is usually well tolerated, but there have been occasional literature reports suggesting that the combination may increase the likelihood of congestive heart failure, severe hypotension, or exacerbation of angina.Long-acting Nitrates: Nifedipine may be safely co-administered with nitrates, but there have been no controlled studies to evaluate the antianginal effectiveness of this combination.Digitalis: Administration of nifedipine with digoxin increased digoxin levels in nine of twelve normal volunteers. The average increase was 45%. Another investigator found no increase in digoxin levels in thirteen patients with coronary artery disease. In an uncontrolled study of over two hundred patients with congestive heart failure during which digoxin blood levels were not measured, digitalis toxicity was not observed. Since there have been isolated reports of patients with elevated digoxin levels, it is recommended that digoxin levels be monitored when initiating, adjusting, and discontinuing nifedipine to avoid possible over- or under-digitalization.Coumarin Anticoagulants: There have been rare reports of increased prothrombin time in patients taking coumarin anticoagulants to whom nifedipine was administered. However, the relationship to nifedipine therapy is uncertain.Cimetidine: A study in six healthy volunteers has shown a significant increase in peak nifedipine plasma levels (80%) and area-under-the-curve (74%), after a one week course of cimetidine at 1000 mg per day and nifedipine at 40 mg per day. Ranitidine produced smaller, non-significant increases. The effect may be mediated by the known inhibition of cimetidine on hepatic cytochrome P-450, the enzyme system probably responsible for the first-pass metabolism of nifedipine. If nifedipine therapy is initiated in a patient currently receiving cimetidine, cautious titration is advised.Nifedipine is metabolized by CYP3A4. Co-administration of nifedipine with phenytoin, an inducer of CYP3A4, lowers the systemic exposure to nifedipine by approximately 70%. Avoid co-administration of nifedipine with phenytoin or any known CYP3A4 inducer or consider an alternative antihypertensive therapy.CYP3A inhibitors such as fluconazole, itraconazole, clarithromycin, erythromycin, nefazodone, fluoxetine, saquinavir, indinavir, and nelfinavir may result in increased exposure to nifedipine when co-administered. Careful monitoring and dose adjustment may be necessary; consider initiating nifedipine at the lowest dose available if given concomitantly with these medications. Grapefruit Juice: Co-administration of nifedipine with grapefruit juice resulted in approximately a doubling in nifedipine AUC and Cmax with no change in half-life. The increased plasma concentrations most likely result from inhibition of CYP 3A4 related first-pass metabolism. Avoid ingestion of grapefruit and grapefruit juice should be avoided while taking nifedipine. Pregnancy Category C: Nifedipine has been shown to produce teratogenic findings in rats and rabbits, including digital anomalies similar to those reported for phenytoin.Digital anomalies have been reported to occur with other members of the dihydropyridine class and are possibly a result of compromised uterine blood flow. Nifedipine administration was associated with a variety of embryotoxic, placentotoxic, and fetotoxic effects, including stunted fetuses (rats, mice, rabbits), rib deformities (mice), cleft palate (mice), small placentas and underdeveloped chorionic villi (monkeys), embryonic and fetal deaths (rats, mice, rabbits), and prolonged pregnancy/decreased neonatal survival (rats; not evaluated in other species). On a mg/kg basis, all of the doses associated with the teratogenic embryotoxic or fetotoxic effects in animals were higher (5 to 50 times) than the maximum recommended human dose of 120 mg/day. On a mg/m2 basis, some doses were higher and some were lower than the maximum recommended human dose, but all are within an order of magnitude of it. The doses associated with placentotoxic effects in monkeys were equivalent to or lower than the maximum recommended human dose on a mg/m2 basis.There are no adequate and well-controlled studies in pregnant women. Nifedipine extended-release tablets should be used during pregnancy only if the potential benefit justifies the potential risk. Nifedipine is transferred through breast milk. Nifedipine extended-release tablets should be used during breast-feeding only if the potential benefit justifies the potential risk. Over 1000 patients from both controlled and open trials with nifedipine extended-release tablets in hypertension and angina were included in the evaluation of adverse experiences. All side effects reported during nifedipine extended-release tablets therapy were tabulated independent of their causal relation to medication. The most common side effect reported with nifedipine extended-release tablets was edema which was dose related and ranged in frequency from approximately 10% to about 30% at the highest dose studied (180 mg). Other common adverse experiences reported in placebo-controlled trials include:Of these, only edema and headache were more common in nifedipine extended-release tablets patients than placebo patients.The following adverse reactions occurred with an incidence of less than 3.0%. With the exception of leg cramps, the incidence of these side effects was similar to that of placebo alone.Body as a Whole/Systemic: asthenia, flushing, painCardiovascular: palpitationsCentral Nervous System: insomnia, nervousness, paresthesia, somnolenceDermatologic: pruritus, rashGastrointestinal: abdominal pain, diarrhea, dry mouth, dyspepsia, flatulenceMusculoskeletal: arthralgia, leg crampsRespiratory: chest pain (nonspecific), dyspnea Urogenital: impotence, polyuriaOther adverse reactions were reported sporadically with an incidence of 1.0% or less. These include:Body as a Whole/Systemic: face edema, fever, hot flashes, malaise, periorbital edema, rigorsCardiovascular: arrhythmia, hypotension, increased angina, tachycardia, syncope Central Nervous System: anxiety, ataxia, decreased libido, depression, hypertonia, hypoesthesia, migraine, paroniria, tremor, vertigoDermatologic: alopecia, increased sweating, urticaria, purpuraGastrointestinal: eructation, gastroesophageal reflux, gum hyperplasia, melena, vomiting, weight increaseMusculoskeletal: back pain, gout, myalgiasRespiratory: coughing, epistaxis, upper respiratory tract infection, respiratory disorder, sinusitisSpecial Senses: abnormal lacrimation, abnormal vision, taste perversion, tinnitusUrogenital/Reproductive: breast pain, dysuria, hematuria, nocturiaAdverse experiences which occurred in less than 1 in 1000 patients cannot be distinguished from concurrent disease states or medications.The following adverse experiences, reported in less than 1% of patients, occurred under conditions (e.g., open trials, marketing experience) where a causal relationship is uncertain: gastrointestinal irritation, gastrointestinal bleeding, gynecomastia.Gastrointestinal obstruction resulting in hospitalization and surgery, including the need for bezoar removal, has occurred in association with nifedipine extended-release tablets, even in patients with no prior history of gastrointestinal disease (see WARNINGS).Cases of tablet adherence to the gastrointestinal wall with ulceration have been reported, some requiring hospitalization and intervention.In multiple-dose U.S. and foreign controlled studies with nifedipine capsules in which adverse reactions were reported spontaneously, adverse effects were frequent but generally not serious and rarely required discontinuation of therapy or dosage adjustment. Most were expected consequences of the vasodilator effects of nifedipine.There is also a large uncontrolled experience in over 2100 patients in the United States. Most of the patients had vasospastic or resistant angina pectoris, and about half had concomitant treatment with beta-adrenergic blocking agents. 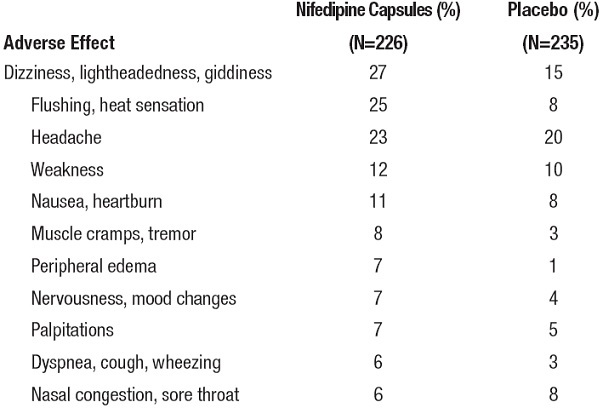 The relatively common adverse events were similar in nature to those seen with nifedipine extended-release tablets.In addition, more serious adverse events were observed, not readily distinguishable from the natural history of the disease in these patients. It remains possible, however, that some or many of these events were drug related. Myocardial infarction occurred in about 4% of patients and congestive heart failure or pulmonary edema in about 2%. Ventricular arrhythmias or conduction disturbances each occurred in fewer than 0.5% of patients.In a subgroup of over 1000 patients receiving nifedipine capsules with concomitant beta blocker therapy, the pattern and incidence of adverse experiences was not different from that of the entire group of nifedipine capsules-treated patients (see PRECAUTIONS).In a subgroup of approximately 250 patients with a diagnosis of congestive heart failure as well as angina, dizziness or lightheadedness, peripheral edema, headache, or flushing each occurred in one in eight patients. Hypotension occurred in about one in 20 patients. Syncope occurred in approximately one patient in 250. Myocardial infarction or symptoms of congestive heart failure each occurred in about one patient in 15. Atrial or ventricular dysrhythmias each occurred in about one patient in 150.In post-marketing experience, there have been rare reports of exfoliative dermatitis caused by nifedipine. There have been rare reports of exfoliative or bullous skin adverse events (such as erythema multiforme, Stevens-Johnson Syndrome, and toxic epidermal necrolysis) and photosensitivity reactions. Acute generalized exanthematous pustulosis also has been reported.To report SUSPECTED ADVERSE REACTIONS, please call Ingenus Pharmaceuticals, LLC toll-free at 1-877-748-1970 or FDA at 1-800-FDA-1088 or www.fda.gov/medwatch. Experience with nifedipine overdosage is limited. Generally, overdosage with nifedipine leading to pronounced hypotension calls for active cardiovascular support, including monitoring of cardiovascular and respiratory function, elevation of extremities, judicious use of calcium infusion, pressor agents, and fluids. Clearance of nifedipine would be expected to be prolonged in patients with impaired liver function. Since nifedipine is highly protein-bound, dialysis is not likely to be of any benefit.There has been one reported case of massive overdosage with nifedipine extended-release tablets. The main effects of ingestion of approximately 4800 mg of nifedipine extended-release tablets in a young man attempting suicide as a result of cocaine-induced depression was initial dizziness, palpitations, flushing, and nervousness. Within several hours of ingestion, nausea, vomiting, and generalized edema developed. No significant hypotension was apparent at presentation, 18 hours post-ingestion. Electrolyte abnormalities consisted of a mild, transient elevation of serum creatinine, and modest elevations of LDH and CPK, but normal SGOT. Vital signs remained stable, no electrocardiographic abnormalities were noted, and renal function returned to normal within 24 to 48 hours with routine supportive measures alone. No prolonged sequelae were observed.The effect of a single 900 mg ingestion of nifedipine capsules in a depressed anginal patient also on tricyclic antidepressants was loss of consciousness within 30 minutes of ingestion, and profound hypotension, which responded to calcium infusion, pressor agents, and fluid replacement. A variety of ECG abnormalities were seen in this patient with a history of bundle branch block, including sinus bradycardia and varying degrees of AV block. These dictated the prophylactic placement of a temporary ventricular pacemaker, but otherwise resolved spontaneously. Significant hyperglycemia was seen initially in this patient, but plasma glucose levels rapidly normalized without further treatment.A young hypertensive patient with advanced renal failure ingested 280 mg of nifedipine capsules at one time, with resulting marked hypotension responding to calcium infusion and fluids. No AV conduction abnormalities, arrhythmias, or pronounced changes in heart rate were noted, nor was there any further deterioration in renal function. Dosage must be adjusted according to each patient's needs. Therapy for either hypertension or angina should be initiated with 30 or 60 mg once daily. Nifedipine extended-release tablets should be swallowed whole and should not be bitten or divided. In general, titration should proceed over a 7–14 day period so that the physician can fully assess the response to each dose level and monitor blood pressure before proceeding to higher doses. Since steady-state plasma levels are achieved on the second day of dosing, titration may proceed more rapidly, if symptoms so warrant, provided the patient is assessed frequently. Titration to doses above 120 mg are not recommended.Angina patients controlled on nifedipine capsules alone or in combination with other antianginal medications may be safely switched to nifedipine extended-release tablets at the nearest equivalent total daily dose (e.g., 30 mg t.i.d. of nifedipine capsules may be changed to 90 mg once daily of nifedipine extended-release tablets). Subsequent titration to higher or lower doses may be necessary and should be initiated as clinically warranted. Experience with doses greater than 90 mg in patients with angina is limited. Therefore, doses greater than 90 mg should be used with caution and only when clinically warranted.Avoid co-administration of nifedipine with grapefruit juice (see CLINICAL PHARMACOLOGY and PRECAUTIONS: Other Interactions).No "rebound effect" has been observed upon discontinuation of nifedipine extended-release tablets. However, if discontinuation of nifedipine is necessary, sound clinical practice suggests that the dosage should be decreased gradually with close physician supervision.Care should be taken when dispensing nifedipine extended-release tablets to assure that the extended release dosage form has been prescribed. Nifedipine extended-release tablets are supplied as 30 mg, 60 mg and 90 mg round, biconvex, film-coated tablets. The different strengths can be identified as follows:30 mg: Yellow round biconvex coated tablets, debossed "30" on one side60 mg: Light brown round biconvex coated tablets, debossed "60" on one side90 mg: Brown round biconvex coated tablets, debossed "90" on one sideBottles of 30: 30 mg (NDC 50742-260-30) 60 mg (NDC 50742-261-30) 90 mg (NDC 50742-262-30)Bottles of 100:30 mg (NDC 50742-260-01)60 mg (NDC 50742-261-01) 90 mg (NDC 50742-262-01)Bottles of 300: 30 mg (NDC 50742-260-03) 60 mg (NDC 50742-261-03) 90 mg (NDC 50742-262-03)Store at 20° to 25°C (68° to 77°F); excursions permitted to 15° to 30°C (59° to 86°F). [See USP Controlled Room Temperature.] Protect from moisture and humidity.